This hunt takes place near Lake Tekapo in an extraordinarily scenic river valley. You will be based out of cabin-style accommodation located directly in the middle of the hunting are where you will be glassing Tahr right from the door of the hut. 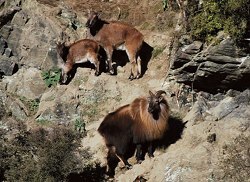 about our Pure New Zealand - Himalayan Bull Tahr and Nanny Tahr package. This hunt takes place on a beautiful property that I was fortunate to hunt on in 2010, and I was blown away by not only the number and quality of game animals but also by the rugged scenic river valley. The 50,000 acre private preserve located in one of the most iconic mountain landscapes in New Zealand Mount Cook and Lake Tekapo will sure to please anyone looking for a classic walk up alpine hunt for Himalayan Tahr that does not employ the use of a helicopter. We can put together a hunt that reflects your fitness levels. If hut-based accommodation is not for you, then there is also the opportunity to be based out of the town of Tekapo just 20 minutes away from the hunting area in a beautiful 4 star luxury lodge based accommodation for just an additional $600 per hunter on a 2x1 hunt or $1200 per hunter as a 1x1. With over 20 years of professional guiding experience it is hard to go wrong with an outfitter like Don Cameron and Pure New Zealand Hunting. With access to many of the nation�s finest private ranches and game estates, Don has the ability to put together some of the best hunting combinations for the outdoor enthusiast. Should you choose to bring your own firearm then there will be a $25NZD New Zealand Firearms permit application fee. To book your hunt dates a nonrefundable deposit of just $500 per hunter will secure your hunt dates.